The IDN platform is build to integrate with existing commercial off-the-shelf applications. Using this integration, you can easily support data entry, reporting, charting, and drawing linking for other applications and databases – even internally developed ones! IDN is a cloud-based platform for designing and deploying asset management enterprise applications that are reliable. This solution allows organizations to adapt to and more effectively manage dynamic workspaces. It provides a secure, authenticated interface to create business processes, dynamic reports, charts, drawings, documents, and more through a variety of interfaces, including Microsoft Windows applications, Autodesk AutoCAD, web browsers, iPad, and Android and iOS. As part of its design, IDN is built of several blocks of functionality that can be used to create a tailored application solution. Each application is built with the Core Components of the platform. By simply “snapping in”, an application can leverage a rich assortment of enterprise caliber capability, such as enterprise web portals, notification, task management, data entry, reporting, charting, and more. There’s no need to purchase additional licenses or more equipment, the IDN platform and applications can quickly adjust to your team. We will handle your infrastructure requirements with our Cloud provider, Rackspace, and you won’t have to wait to add more users. You also won’t have to wait for updates or maintenance on servers to disrupt your workflow or need to hire more internal IT personnel. The scalability of the IDN platform will save your organization thousands of dollars by managing your infrastructure and platform for you. Have all of your asset information at your fingertips on your mobile devices, including CAD drawings and data needed to carry out tasks. Any changes made in the field are automatically synced with the MS SQL Server ensuring all data changes are up-to-date. With the IDN mobile framework, our platform can link applications to Application Programming Interfaces (APIs) Services including user management, push notifications, integration with social networking services and more. We use the Telerik Platform to develop custom mobile apps so your mobile interface (iOS, Android) is more functional for field work. Kendo UI allows us to use over 70 UI components such as big button menus and drop-downs create an easy interface for navigation. 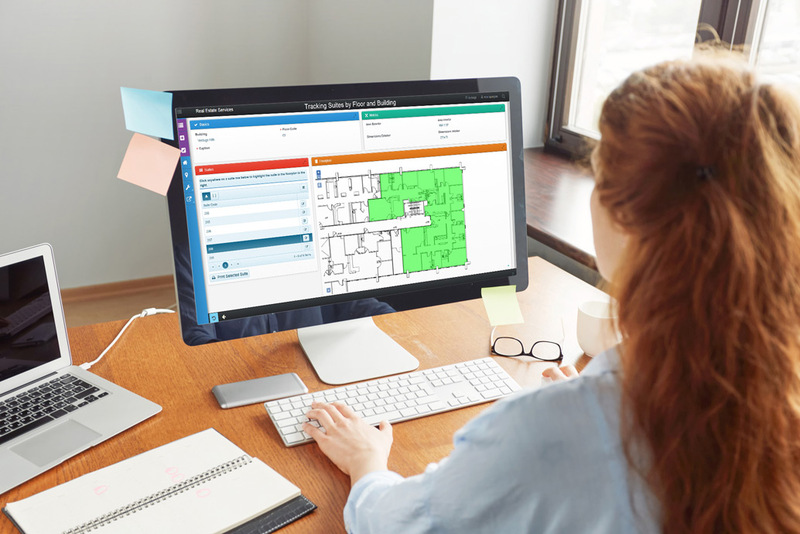 Facility managers and field personnel can input, track, and update requests or tasks in real time. Achieve a higher level of service and responsiveness by making and implementing decisions instantly, anywhere and anytime, with up-to-date data. Effortlessly locate and access any workplace information with Big Button menu options on your iPad. Simplicity in design means an easy-to-use interface, constant communication, and feedback help to improve productivity and minimize downtime. Attach photos, videos, and voice messages to work orders from on-site. By sharing a single MS SQL database, all stakeholders can access the latest version of data from the field and the office. Role-specific logins and permissions also mean each stakeholder connects to the data they need instantly, rather than waiting on reports, spreadsheets, or paper forms. Users will receive notifications on requested work, completion, and just about anything else you need your team to know when they are in the field. Data is instantly updated within the database and across each User’s application. It’s just that easy. Integrate IDN components with pre-existing systems, from off-the-shelf products to internally design systems. We can customize your integration between one or more databases, spreadsheets, XML files, or text files so data is pushed on demand or at scheduled intervals. Simple, secure, defined XML web services allow you to communicate and integrate information between IDN applications with other systems in your enterprise. Eliminate redundant systems that contain the same processes, like work requests or customer satisfaction surveys, or the same information, like property or asset information.